NYC waste-trivia-fact: New Yorkers throw away about 386 million pounds of textiles every year. That seems like an awful lot of stuff that can probably still be put to good use, right? Right. Fortunate for us, there is a company, Wearable Collections, that works to make good with what we no longer want/need/can use and they make it easy for us to let them make good. On an anecdotal note, I have been the lucky recipient of all sorts of wonderful appliances that have hastily been thrown out in affluent neighborhoods…so it is possible that some people will never change and they won’t take advantage of Wearable Collections’ services. But for those of us who do want to keep stuff out of the landfill and benefit charities at the same time, they bring an invaluable service. While they have tables at many farmers markets and drop off locations around the city on a regular basis, Saturday, April 30th at 115th Street and Park Avenue, there will be a drop off event from noon to 5pM. The newly revamped La Marqueta, home to Hot Bread Kitchen, a culinary business incubator and other delightful food vendors is also right there. 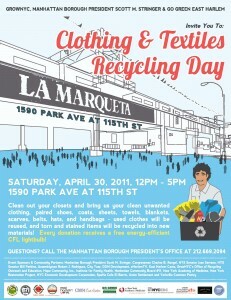 So you can drop off your clothes, get a free CFL light-bulb in exchange and visit the fabulous new faces of La Marqueta. This event is sponsored by GrowNYC, The Manhattan Borough President Scott Stringer’s Office and Go Green East Harlem, in addition to a multitude of partnering organizations. If you have questions about it, you can call the Borough President’s Office at 212.669.2094.